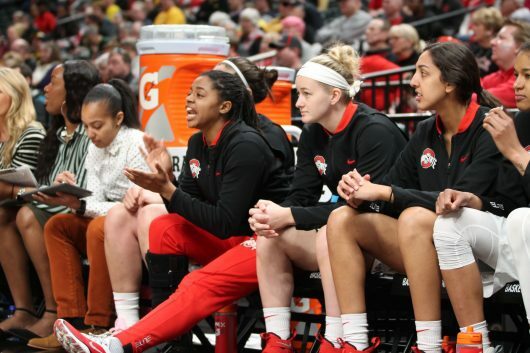 INDIANAPOLIS — The day before the Ohio State women’s basketball team took the court against Rutgers to begin its quest to claim the program’s first Big Ten tournament championship since 2011, senior guard Asia Doss cried. Athletic trainer Chalisa Fonza and a team doctor had just told her she would not play Friday afternoon in the quarterfinal game of the tournament after spraining her ankle with about eight minutes remaining in the regular-season finale versus Penn State. Doss learned she will be day-to-day in the tournament, the final one of her collegiate career. The tears streamed, but Fonza and the doctor would not change their minds. Doss has been a staple on the Ohio State women’s basketball team for the past four seasons. The Buckeyes have relied on her relentless, energetic style of play for their full-court press defense for 134 straight games. Not only has she played every game in her nearly four-year career, but she has started 104 of them. Without Doss, Ohio State went away from its typical four-guard starting lineup. It started senior forward Alexa Hart for the first time this season next to redshirt junior forward Stephanie Mavunga. Hart’s value rose when Mavunga picked up her third foul before halftime, shortly after redshirt junior forward Makayla Waterman — the only other post player who plays large minutes — committed her third foul. Hart had 10 points, scoring in double-digits for the fifth time this season, and grabbed six rebounds. The loss of Doss was not felt on offense. She averages eight points per game with an inefficient 33.6 shooting percentage. Doss takes an average of 4.4 3-pointers per game with a 26.3 percent success rate. Instead, she makes a major impact on games with her defense. Doss usually plays at the top of the Ohio State press defense, bothering ball-handlers as they work their way down the court. Despite not having Doss, the Buckeyes held Rutgers to 32 percent shooting from the field and 22.7 percent shooting from beyond the arc. While sitting on the bench in a walking boot, Doss disposed of her role as a defensive specialist in favor of the job of a coach, screaming instructions at her teammates. Head coach Kevin McGuff said Doss will be 100 percent for the NCAA tournament if she sits out “now.” The Buckeyes have a doctor who will continue to evaluate her to determine whether she will be able to play, McGuff said. Doss said she was feeling 95 percent and only sat for for precautionary reasons with knowledge that it will be important for the team to have her fully healthy in the NCAA tournament in two weeks. “If we really, really had to play her [against Rutgers], I think there’s a chance we could, but we’re trying to give her a little bit of rest,” McGuff said. If the Buckeyes do not have Doss in the semifinals against Minnesota, they would likely have to once again rely on succeeding in a slower game with Hart starting beside Mavunga. Last season’s Big Ten tournament run ended in disappointment with a loss to Purdue in the semifinals. To avoid another earlier-than-anticipated loss, the Buckeyes must ensure teams don’t take advantage of their seven-person rotation.